Starting law school can be a scary thing. As scary as thinking it is a good idea to watch that horror movie late at night when you are home alone, or finding a big spider above the ceiling of your bedroom (okay I have to admit, that one is possibly scarier than attending law school). Now that I have graduated, I can look back at my experience studying law and reflect on my personal journey. Even though I succeeded in getting that coveted law degree, I still wish I had done or knew particular things about studying at uni that I know now, before I actually started law school. In today's blogpost - the very first in my new Back to Law School/University series, I am going to be sharing the things I wish I knew before starting law school/university. If you are just starting with your first year of law school (or even if you are at the beginning of your second, third or last year of law school), it can be quite challenging to immediately dive in. You are just starting a new chapter of your life, met a lot of new people, and possibly moved to a different city far away from home. You may feel the urge to just wait and see how things are going to work out for you. However, this chill attitude won't get you through law school. You have to put in the work from the start. Do your homework from the start, be prepared for every lecture, and ask questions if you don't understand something (which is by the way, totally okay - just make sure your question is specific enough that the professor sees you took the time to read through the material). Another lesson that I have come to understand after my years in law school, is that every law students path is different. Some people will study pretty much every day in the library, focusing on getting those 10/10 or A+. Others will go to every networking event and try to nail that first internship before they even really know what the legal system is. This can often put pressure on yourself, wanting to do the exact same things as your peers are doing, as well as being just as successful in those things as well. However, whatever they do - it is their law school path, and not yours. You should not feel pressured to follow in their footsteps. Instead, focus on your own skills and abilities and try to improve them, as well as stepping out of your comfortzone. In the end, all our lives are going to be different, so don't try to be the same as the rest. Another thing I wish I knew before starting law school is that it's not about studying hard, but about studying smart. It's not about pulling those all nighters in the university library every week, but about the material you are actually focusing on. A professor will never be able to ask every little detail of the study material during the exam due to time limits. That is why you should not focus on reading everything from cover to back, but on the topics the professor spend more time on. Read through your lecture notes, and spend most of your time on topics the lecturer was interested in, is specialized in, or are generally very important. You can also contact the professor and ask him or her what topics you should spend most of your study time on. This way, you will spend your study time more effectively, which will also give you better results in the end. Last, but not least: You should focus on understanding, rather than just memorizing the study material. Being in law school is going to be very time consuming. You will have a lot of readings every week, papers to write, and deadlines to finish as is. However, professors and study books will often refer to additional study material or cases to read. This is study material you will not receive any questions about on the final exam, but it is considered useful and helpful information to the required study themes. Your first thought reading this would probably be "ain't nobody got time for that", but I highly recommend you to make some time for it, especially if you find a particular topic difficult or hard to understand. Reading additional texts that elaborate more on the history, technicalities, and reasoning behind certain legal mechanisms will make you understand the study material. This way, you are not just blatantly memorizing the law, you will understand how it works and how to apply it in specific cases. I hope you enjoyed reading this blogpost and it was somewhat helpful to anyone considering going to law school or university! If you are interested in more detailed explanation, definitely check out my first episode of my Back To Law School/University video series, and don't forget to subscribe to my Youtube channel as well. Definitely don't forget to tune back in the day after tomorrow, because there will be another Back To Law School/University related blogpost & video up! WHAT IS A THING YOU WISH YOU KNEW BEFORE STARTING (LAW) SCHOOL? P.S. 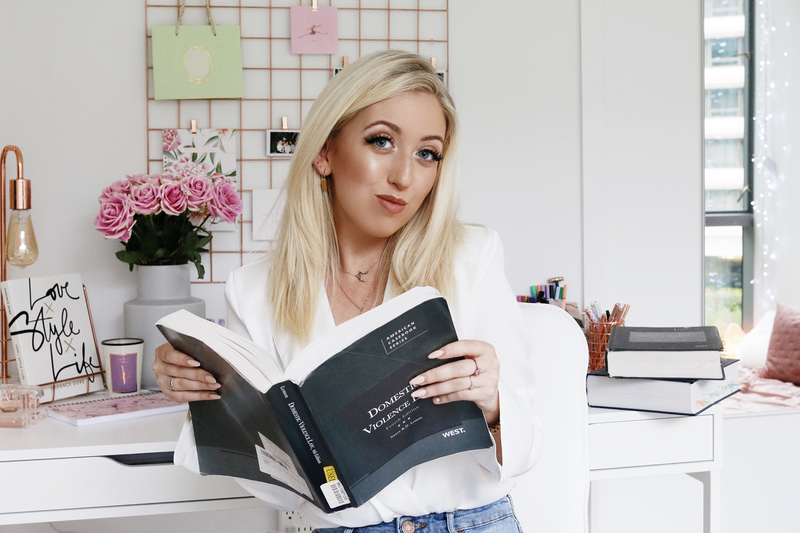 Want to know more about how I prepared myself for Law School Exams? 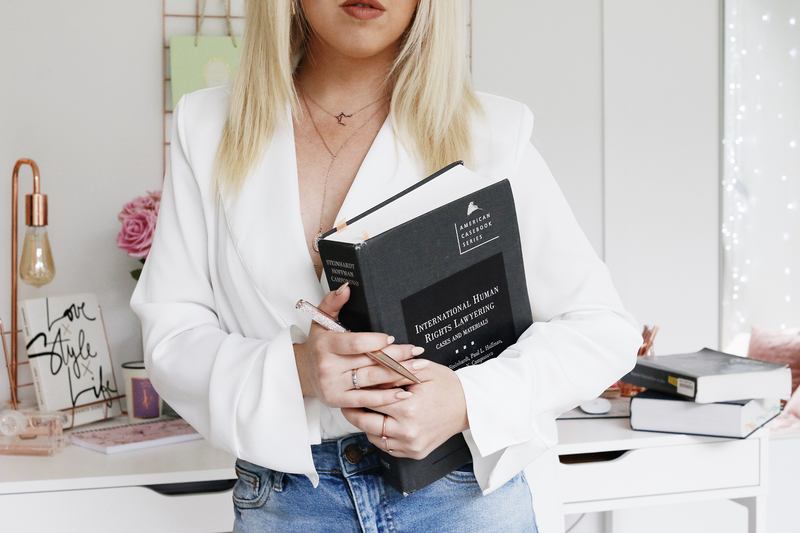 Check out My Study Routine for Law School/University Exams blogpost! Next Post Why I Have Been Gone. I really wish I had known how time consuming my field of study (history) was going to be, I am now “paying” for that by that retaking some of my previous classes.. and I fear that I will make the same misstakes as I did the first time which is very stressfull. I totally agree with you about driving straight in! I’m going into my 3rd year and I regret not making the most of every lecture, talk, societies, etc! Awesome vlogging post. Great ideas and your thoughts are just mesmerizing. Hi, Where have you bought your neckless? I Also want to say that I really like your style and your videos! !